Cars are not funny. Speeding cars are not funny. It is not funny when a car spins around and speeds in the other direction. It is not funny when a car flies through the air. It is not funny when a truck crashes into a car. It is not funny when cops chase speeding cars. It is not funny when cars crash through roadblocks. None of those things are funny. They have never been funny. People are not amused by them. No, not even the people unlucky or unwise enough to have paid money to see a movie like "Speed Zone" - or a movie like "The Cannonball Run," of which "Speed Zone" is a pathetic clone. Audiences sit in dead silence. Hollywood does not seem to understand this basic principle, which is why so many movies have featured chases, crashes and flying automobiles in recent years. Occasionally a chase will indeed be exciting - when it has something to do with the plot, as in "The French Connection" or "To Live And Die In L.A." But when a movie is all chases and crashes, then the intelligent viewer will realize that what he is seeing is a big payday for a lot of stunt drivers, and he will lose interest. Nonstop chase-and-crash comedies have provided some of the worst movies of recent years (both "Cannonball Run" movies, the "Smokey" sequels, etc. ), but even in that dismal company "Speed Zone" sets some kind of record. This is a movie that lasts 95 minutes and contains one (1) laugh. To save you the admission price, here is the joke: Dickie Smothers: "We've got to go to the Dulles airport." Tommy Smothers: "What are we going to Fresno for?" Dickie: "What makes you think we're going to Fresno?" Tommy: "Well, you said the dullest airport, didn't you?" 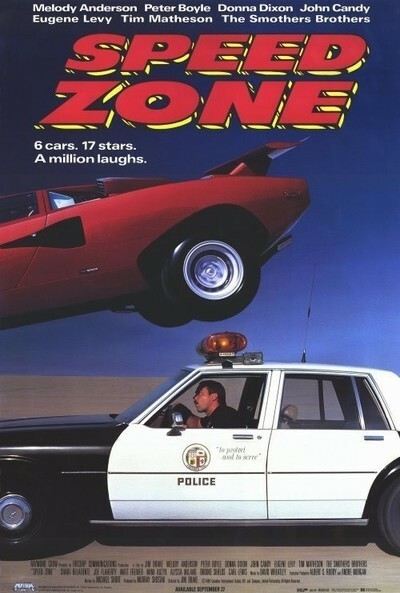 None of the other jokes in "Speed Zone" measure up to that standard. The movie is still another waste of John Candy, who makes a movie like "Planes, Trains and Automobiles" that showcases his genuine talent and then waltzes into a cynical, no-brainer ripoff like this with nothing more on his mind, apparently, than the rent check. The movie features countless other celebrities in bit roles, but none of them make as lasting an impression as the Michelin trademark, which is displayed throughout the film in a blatant example of product promotion. Will Michelin sell more tires this way? I wonder. Would you trust your life to tires made by anyone who thought association with this film would improve their product's image?